By 1793, the violence of the Revolution dramatically increased until the beheadings at the Place de la Concorde in Paris became a constant, leading a certain Dr. Joseph Guillotine to invent a machine that would improve the efficiency of the ax and block and therefore make executions more humane. David was in thick of it. Early in the Revolution he had joined the Jacobins, a political club that would in time become the most rabid of the various rebel factions. Led by the ill-fated Georges Danton and the infamous Maximilien Robespierre, the Jacobins (including David) would eventually vote to execute Louis XVI and his Queen Marie Antoinette who were caught attempting to escape across the border to the Austrian Empire. 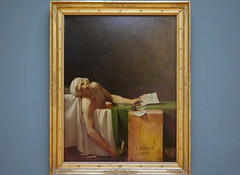 At the height of the Reign of Terror in 1793, David painted a memorial to his great friend, the murdered publisher, Jean Marat. 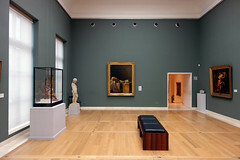 As in his Death of Socrates, David substitutes the iconography (symbolic forms) of Christian art for more contemporary issues. 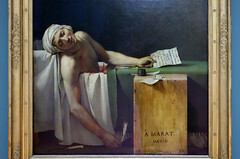 In Death of Marat, 1793, an idealized image of David’s slain friend, Marat, is shown holding his murderess’s (Charlotte Corday) letter of introduction. 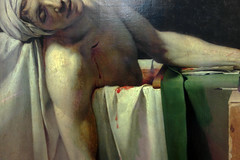 The bloodied knife lays on the floor having opened a fatal gash that functions, as does the painting’s very composition, as a reference to the entombment of Christ and a sort of secularized stigmata (reference to the wounds Christ is said to have received in his hands, feet and side while on the cross). 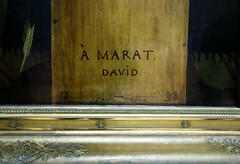 Is David attempting now to find revolutionary martyrs to replace the saints of Catholicism (which had been outlawed)? By 1794 the Reign of Terror had run its course. 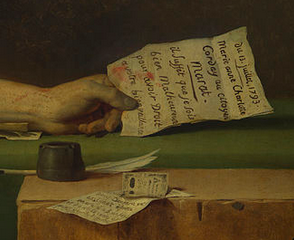 The Jacobins had begun to execute not only captured aristocrats but fellow revolutionaries as well. 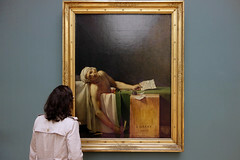 Eventually, Robespierre himself would die and the remaining Jacobins were likewise executed or imprisoned. 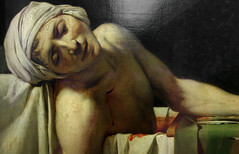 David escaped death by renouncing his activities and was locked in a cell in the former palace, the Louvre, until his eventual release by France’s brilliant new ruler, Napoleon Bonaparte. This diminutive Corsican had been the youngest general in the French army and during the Revolution had become a national hero by waging a seemingly endless string of victorious military campaigns against the Austrians in Belgium and Italy. 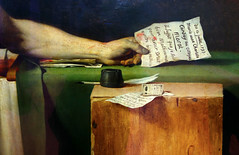 Eventually, Napoleon would control most of Europe, crown himself emperor, and would release David in recognition that the artist’s talent could serve the ruler’s purposes. 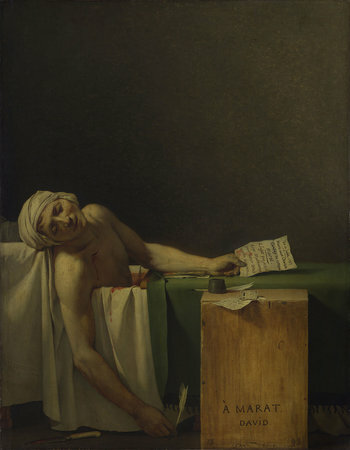 Cite this page as: Dr. Beth Harris and Dr. Steven Zucker, "Jacques-Louis David, The Death of Marat," in Smarthistory, January 7, 2016, accessed April 24, 2019, https://smarthistory.org/jacques-louis-david-the-death-of-marat/.